The total T3 test checks the total T3 blood level. What is a total T3 test? A total T3 test measures the total T3 blood level. What is the importance of a total T3 test? The total T3 blood test helps evaluate thyroid function by measuring how much T3 hormone it is producing. This T3 Total Test is a blood test. The T3 total test, also known as a T3 total lab test, total T3 blood test, and triiodothyronine test, measures the T3 blood level. T3, or triiodothyronine, is a hormone produced by the thyroid gland that helps regulate metabolism. Total T3 refers to T3 hormone that is both bound and unbound to T3 carrier proteins in the blood. T3 is released by the thyroid gland when thyroid-stimulating hormone, or TSH is high which is why the T3 total blood test is frequently done at the same time as the TSH test. To get a clearer picture of the body's T3 level, the total T3 blood test is often done with the free T3 test to assess bound and unbound T3 levels. T3 testing is helpful in assessing overall thyroid function and whether the thyroid gland is underactive (hypothyroid) or overactive (hyperthyroid). In checking for these types of thyroid conditions, the T3 test is often performed with the total T4 test to assess another important thyroid hormone at the same time. Because of the information it conveys in regards to possible hyperthyroidism and hypothyroidism, the total T3 test can be found in the hyperthyroidism test panel and the hypothyroidism test panel respectively. To get a T3 total test near you, simply order online and get your blood drawn at Quest Diagnostics. Once your T3 total lab results are ready, they will be available for download. 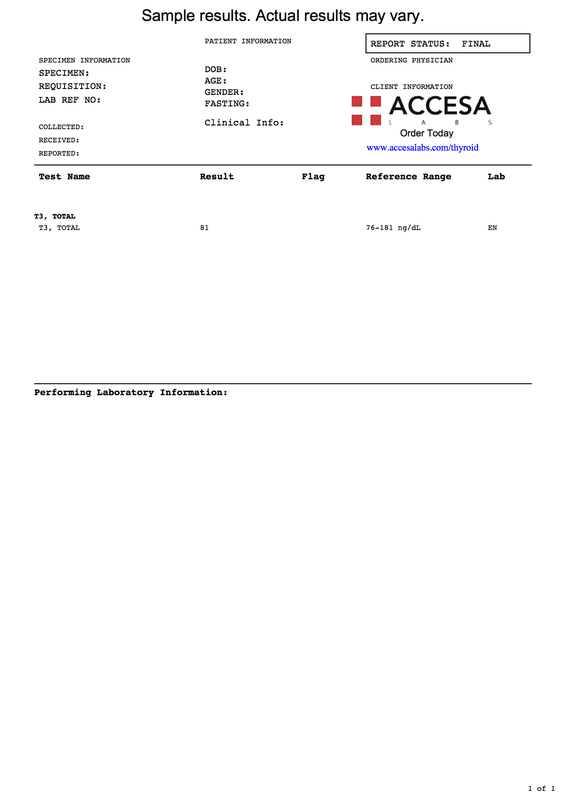 As can be seen on the sample T3 total lab report, the T3 blood levels are reported as a number and can be compared against the reference ranges provided by the lab. T3 Total Test at Guaranteed Prices.